Read our definitive matched betting guide to learn more about this brilliant money making opportunity called matched betting. Are you tired of the bookies continuously taking your hard earned cash, you just want some extra disposable income to spend or you’re at uni and you want to pay off your student debts? Well, matched betting might be for you. This method is the BEST way to make money online and it’s used by thousands of people across the UK. If you’re new to no risk matched betting or just getting started, you’ve found the right page. Matched betting is a risk free betting technique taking advantage of the huge range of bookmakers’ free bets and promotions. The betting industry is incredibly competitive and the bookies are continually offering free bets to entice both new and existing customers to bet with them. We can make a guaranteed profit from a great deal of these offers which makes matched betting so profitable. This comprehensive matched betting guide will give you all the information you need. Matched betting is a brilliant method of making money online. Unfortunately, there aren’t enough people that know about this awesome technique. What’s more there are so many guides out there that don’t cover matched betting properly and give it enough justice. That’s why we wrote this definitive matched betting guide. With this guide, we aim to educate and dispel common misconceptions around matched betting whilst showing you how profitable matched betting is. Whether you’ve heard of matched betting or not, you’ll find this guide incredibly helpful on your journey to matched betting success in 2018 and beyond. Matched betting or double betting as it’s sometimes called, has been around for a long time. However, the early years weren’t nearly as profitable as they are now. In essence, matched betting was first facilitated back in 1999 when Betfair created the first peer to peer betting exchange – more on betting exchanges later in the matched betting guide. However, no one was interested. There were very few offers available and online betting hadn’t hit the main stream – most punters still preferred to bet in store. It wasn’t until roughly 2010 when the online betting industry took off. Betfair are arguably the driving force behind this movement. They made the giant high street stores like Ladbrokes and Coral get off their laurels and take some action. With the huge amounts of traffic and ease of placing bets online, the industry suddenly became very competitive. That’s when the bookies started offering free bets and bonuses to entice customers. With reduced barriers to entry the number of bookies also increased. As time went on and online betting started to really take hold, bookies started offering more and more free bets. That’s when matched betting really came into its own. In the last 5 years or so its popularity has grown extensively. This method is now at it’s most profitable thanks to a huge range of offers, expert help guiding you through the entire process and specialist software and tools that maximise the value out of each matched betting offer. Next up in our matched betting guide, we’ll discover how double betting works. Matched betting can be a challenging concept at first but with help from sites like The Sure Bettor, you’ll soon have the technique nailed. As we’ve already mentioned, matched betting takes advantage of bookmakers’ free bets and promotions. We use a risk free betting technique called back and lay betting which mitigates any chance involved with normal gambling. This method involves placing two bets at different betting companies. We place one bet at a traditional bookmaker and the other at a betting exchange. So what is back and lay betting? This is the most popular and common type of betting. You’ll place this kind of bet on the high-street with traditional bookmakers like Coral and Ladbrokes. Let’s say you head to the Coral website or your local store and place a bet on Man City beating Chelsea. This is a back bet as you’re backing Man City to win. Lay betting is basically the opposite of back betting. You can only place lay bets at betting exchanges which we’ll look at in more detail next. Placing a lay bet is the same as betting an outcome won’t happen. So, using the example above it’s the same as betting Man City will NOT beat Chelsea. Note: We are not betting that Chelsea will win, that’s something different. In the event of a draw our lay bet would win as Man City did NOT beat Chelsea. Check out our back and lay betting guide for more information. For each matched bet we complete, we place one back bet and one lay bet on the same market. These two bets effectively cancel each other out rendering this process risk free. You’re probably thinking what’s the point in that? We just end up where we started. You’re right, we do and that’s the whole point. We never put any of our own money at risk. We make a guaranteed profit when the bookies give us a free bet to use. All will become clear in the matched betting example below. If you’re new to matched betting or betting as a whole, you may not have heard of betting exchanges. They’re not as commonplace as traditional bookmakers and they haven’t been around for as long so you’re less likely to recognise the brands like you do with bookies. Having said that, you’ve probably seen advertisements online and on TV for Betfair, the largest betting exchange. They’re constantly running adverts during football games and other sporting events. Like other large betting companies, their marketing budget must be enormous. So what exactly are betting exchanges? Betting exchanges are online marketplaces which match gamblers looking to place opposite bets. They allow the bettor to play the part of a traditional bookmaker if they wish. A betting exchange is built around a different concept to more traditional bookmakers. They simply act as the go between for two or more punters looking to place opposite bets. They provide the technology to match gamblers. When you place a bet at a betting exchange you’re playing against another gambler, not the bookie. The exchange make money by charging a commission on a player’s net winnings. The commission a betting exchange charges differs between companies but ranges from 2-5%. At a bookmaker there are not multiple parties. You simply place a bet against the bookie. The sportsbook makes money if they win the bet and loses money if they don’t. Having said that, they calculate the odds so that the house always wins in the long run. Betting exchanges have had a huge impact on the betting industry since their creation back in 2000. This is mainly due to the inherent benefits of the exchange model including higher odds and greater flexibility for the bettor. Matched bettors have a lot to thank betting exchanges for as they allow us to make matched betting risk free. Without them, we wouldn’t be able to make money with this method. Betfair were the first company to create the breakthrough platform in 2000. Since then they’ve dominated the industry, consistently beating Betdaq to the betting exchange top spot. However, Smarkets are bringing a new challenge to the more established betting exchange giants. But which is the best betting exchange to use for matched betting in 2018? Which betting exchange should I use? As betting exchanges are pivotal to matched betting, it’s important to select the best one for our needs. A lot of matched bettors end up choosing between Smarkets and Betfair for good reason. Smarkets provide a brilliant, low commission rate where as Betfair provide greater liquidity due to their age and popularity. Both will more than satisfy your matched betting needs. For more information on which is the best betting exchange check out our guide here. Never placed a bet at a betting exchange or not sure what to do? Placing bets at an exchange is incredibly easy and very similar to traditional online bookmakers. Follow the process below and you’ll be well on the way to being a betting exchange pro. Step 1 – Find the market you want to place a bet on. In this example I’m placing a bet on the Masters 2018 – Note: I’m using the Smarkets betting exchange. So I navigate to the correct market. In this case I’m betting on Jordan Spieth. Step 2 – Choose whether you want to place a back bet (green) or a lay bet (blue). You’ll usually use the betting exchange to place your lay bets as it allows us to make our matched bets risk free. I’ve selected the lay market in this example with odds of 12.0. Step 3 – Once you’ve selected the market, simply enter your stake and hit place bet. Our aim with this article was to create an all in one matched betting guide which covered everything. There are a number of techniques and methods we use to increase the effectiveness and efficiency of matched betting. One of these is using decimal odds instead of the more popular and common fractional odds. One of the key parts to matched betting is checking and comparing the odds between the bookmaker and the betting exchange. As you can see from the example above, it’s much easier to compare decimal odds than it is fractional odds. You can calculate the difference much more efficiently. This allows us to place our bets more quickly, potentially take advantage of greater odds and ultimately make more money online. Most bookies show their odds in fractional format as the default, however, we can easily change this. This can be done either in your account settings or somewhere on the homepage. Betting exchanges already show their odds in decimals so there’s nothing to change there. Occasionally we’ll need to change the odds format ourselves. There are a number of ways to do this. We can either use a website with a calculator like Odds Converter or use some simple maths. Simply divide the fractional odds and add 1.0. So, to convert 3/1 into decimal odds we would divide 3 by 1 and add 1.0. This gives us 4.0. You’ll soon be able to convert the odds in your head quickly and efficiently, allowing you to work out the potential of each market. This is one of the key aspects of matched betting, one which some sites and services tend to skim over. Unfortunately for punters, the bookies don’t give out free bets to anyone and everyone. They want something in return. Ladbrokes offer a £20 free bet if you bet £10 on the Premier League Final. In the example above, you simply need to wager £10 on the Premier League Final at Ladbrokes. You’ll then be entitled to a £20 free bet which we make a guaranteed profit from. With matched betting, there is no risk involved. As we mentioned earlier, we use back and lay betting to ensure nothing is left to chance. Whatever the outcome of the event, one of our bets will win and one will lose. It’s important to add, you don’t make any money from the qualifying bet. In most cases you’ll actually lose a small amount qualifying for your free bet. However, this is usually less than £1. As a general rule, we aim to lose no more than 5% of the overall back stake qualifying for a free bet. So for a £10 bet, we’d aim to lose no more than £0.50 to unlock our free bet. Like any matched bet, we know the exact amount we’ll win or lose before we place any bets thanks to the matched betting calculator. Overall, qualifying bets are a necessary evil to access our free bets. If you look at it like you’re unlocking free money, you won’t have a problem completing qualifying bets in the future. Next up in our matched betting guide, we’re going to look at who matched betting is for. Now we know what matched betting is and how it works, let’s find out who suits matched betting and why. Are you tired of the phrase ‘the house always wins’ always ringing true? Are you a student looking to pay off debts? Or do you just want some extra cash to bolster your bank balance? Whatever the reason, matched betting is the best way to make money online and literally anyone can use this method. You just need to be at least 18 years old, have a UK address and have access to a computer or laptop. Live outside the UK? Check out this article for more information. You don’t need any prior knowledge of the betting industry and a vague interest in sport is helpful but not essential. We walk you through the whole process with expert tutorials and an outstanding customer support network. It’s no secret, students are always looking for ways to increase their income and there’s arguably no better way than with matched betting. One thing most students have in common is limited amounts of free time. Whether it’s completing the latest assignment or getting ready for the night out, there’s always something on. Thankfully matched betting takes very little time and is one of the main reasons it’s so popular with students across the UK. Matched betting is very popular with stay at home parents looking to make a little extra income. Similar to students, stay at home parents usually have lots of other things on their lists and therefore don’t want to spend ages matched betting. Some of our members at The Sure Bettor were originally seasoned gamblers. They got sick with the bookies continually winning their hard earned cash and decided to get their own back. Matched betting is the number one way to do this. As you can see, our members come from all walks of life and each have their own reason for taking part in matched betting. Why not join them and start your own matched betting journey today? The question everyone wants to know the answer to… we couldn’t miss this one off our matched betting guide. Matched betting is one of the most profitable and effective methods to make money online. Period. It’s so profitable, thousands of people already use this brilliant method to great success. If you put the time and effort in, I guarantee you’ll make a great second income online. If you follow our advice and complete all the latest matched betting offers you can easily make up to £1000 every month. Whilst this might be the higher end of potential earnings, most of our members average about £500 a month. Over a year, that’s an insane amount of extra profit to take home. Furthermore, all of our profits are tax free. All profits made through betting are exempt from tax giving them an advantage over other sources of income which are subject to tax. The tax man sees none of our earnings, meaning more money in your pocket. I’m almost certain matched betting is one of the only ways to make money online tax free. If there’s another way you know of, please let me know (and it has to be legal). How much time will matched betting take? It really depends on how much time you invest in matched betting. There will always be offers for you to complete. Most of our members spend approximately 1 hour a day completing the most recent offers. However, on days when there is more sport on, members are matched betting for longer, as there are more offers to complete. This can sometimes be up to 2 hours in one day. It’s important to note, these are the people that are making at least £1000 each month. It’s no secret that the more time you invest, the more money you’ll make. For the time investment, no risk matched betting is the number one way to make a lot of money in a short space of time. As we mentioned earlier, this method is incredibly profitable when done correctly. Next in our matched betting guide we’ll look at how specific tools and software can help to increase your profitability and make the most out of matched betting. Long gone are the days when matched betting was a time consuming and manual process. These days, we have software and tools that greatly speed up the process, allowing you to save time and ultimately make more profit. Thanks to these tools and a greater range of offers, matched betting is definitely at its most profitable. The matched betting calculator is the single most used tool in our matched betting arsenal and it’s the one that helps us make matched betting completely risk free. Learning to use the calculator is a must for matched betting success in 2018 and beyond. Select the correct bet type. This will depend on whether you are using a free bet or qualifying for one. Risk free bets are more advanced matched betting techniques that we’ll cover in another article. Enter the required figures and hit calculate. Depending on the bet type selected, the calculator will require different figures. We go through all of this in our members area which is free to join. Note: The calculate button will only show once the required figures have been entered. 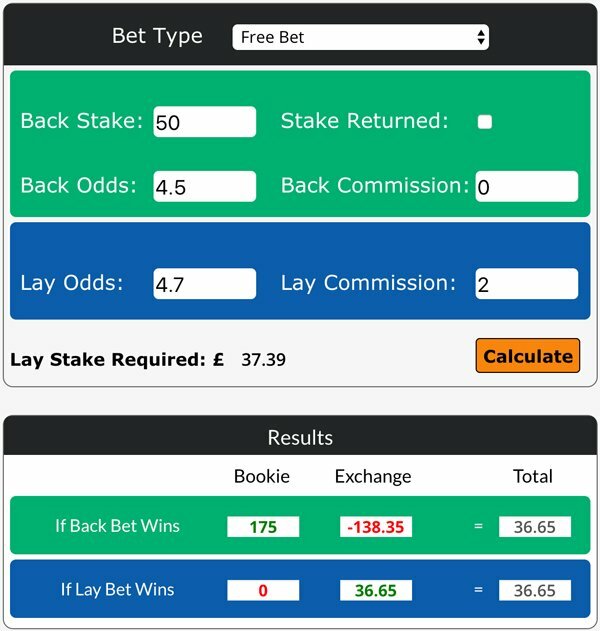 The calculator works out the best lay stake to either minimise losses or maximise profits. The matched betting calculator will tell you the exact amount you’ll win or lose depending on the bet type selected. There’s a bit more to it, but that should give you an idea of how important the matched betting calculator is and why it makes the process so much easier than before. This probably all sounds too good to be true. This is a perfectly acceptable reaction and it’s common for people to feel that way. It’s exactly how I felt when I first came across matched betting. I was sure this risk free technique involved some dodgy, illegal method. As the old saying goes, if something looks too good to be true, it probably is. Well, not with matched betting. After extensive research, it became apparent that this method of making money was totally legitimate. Matched betting is completely legal as we are just using the bookmakers free bets that they offer customers and offsetting them with another betting company. So there’s nothing illegal about matched betting, but are the bookies happy with this technique? It’s a bit of a grey area in terms of what the bookies think about matched betting. Some are okay with it and others aren’t so keen. The bookies are in the betting industry to make money. They’re going to restrict or gub accounts that are continually winning and hurting their bottom line whether they’re matched bettors or regular gamblers. You might be asking what gubbing is. It’s the term matched bettors and gamblers use to describe when a bookmaker restricts our accounts in some way. One thing’s for sure, the bookies aren’t keen on players who only take advantage of free bets. Therefore we need to use techniques to mask our betting patterns. One way to do this is by placing regular bets. That’s where mug betting comes in. Mug betting is the process of placing bets on markets that don’t qualify for free bets. It’s that important, it made it to our top 6 tips for matched betting success in 2018. We recommend you place a mug bet for every matched betting offer you complete. Despite this, the bookies may still restrict accounts that are simply winning too much. In an ideal world, we want to win all our matched bets at the betting exchange and lose all our bets at the bookie. Obviously this is not possible, but it’s worth considering when picking the market for your bets. With this risk free betting technique gaining more attention each day, more people are finding out about this method and documenting it’s effectiveness online. Here are just some of the large media sources who also love matched betting. Head to our love for matched betting article to find out more. Matched betting can be quite a challenging concept at first – which is why it’s important to get some expert help. There are numerous sites out there that can help you maximise your profit from this method with some obviously better than others. Here at The Sure Bettor we are continually finding new ways to impress our members and make it easier to make money online using no risk matched betting. We have a number of brilliant features like Tracking Plus and of course, outstanding tutorials that take you through the whole process. Being one of the fastest growing matched betting communities, we must be doing something right. Despite being a brilliant platform to learn matched betting, we still offer one of the most competitive rates in the industry. We charge £11.99 for a monthly membership and you can get a year’s worth of matched betting expertise for just £99.99. We even offer a free trial, something you won’t find with every matched betting service. One of the great things about membership at The Sure Bettor is that you’ll earn enough in your first offer to pay for the first three months worth of membership. Don’t just take our word for it, why not find out what some of our members are saying. You can read Seb’s complete matched betting testimonial here. Below, I’ll show you how profitable this no risk betting technique is and why you should start matched betting today. Note: This example is purely fictional. So, let’s say Ladbrokes offer a £50 free bet when you sign up and stake £20. Opening an account at a betting exchange is the first step to matched betting success. This is where we place our lay bets to mitigate any risk from matched betting. There is also a Smarkets sign up offer which you can take advantage of. The next step is to register with Ladbrokes. Simply visit the Ladbrokes site through the correct link, shown within our members area, and enter the required information. Once you’re signed in, you’ll need to deposit £20 to help complete your qualifying bet and unlock your free bet. We recommend you deposit using a credit or debit card as some offers are restricted to only these payment methods. Once you’ve deposited the required funds, we recommend you change the odds format from fractional to decimal odds. Qualifying market. Sometimes the bookies state you must place your bets on a certain market to qualify for your free bet. Minimum odds. There are always minimum odds requirements for qualifying bets and this is sometimes the case with free bets. Minimum stake. The bookies sometimes state you must wager a minimum amount to qualify for your free bet. These are the most important things to consider, however there are sometimes other conditions we need to watch out for. We display all the offers and their respective terms and conditions within our members area. Now it’s time to place your qualifying bet. So you need to search for a suitable market where the back and lay odds are as close together as possible to ensure you maximise the profit from the offer. For a qualifying bet, it’s best to look for a market with stable odds around 3.0. Football games are usually a great option for beginners to place their bets on. In this example we’ve gone for a market with back odds of 3.0 and lay odds of 3.2. Once we have these figures we can go ahead and enter them into the matched betting calculator. So the calculator tells us our lay stake need to be £18.87. This is the amount we need to stake at the betting exchange. The calculator also tells us we’ll lose £1.51 qualifying for our free bet. This is a typical loss from a qualifying bet. Whilst this loss is slightly more than the 5% we recommended earlier, it’s good enough for this example. Now we can go ahead and place our bets. It’s important to always place the back bet before the lay bet. Before you place the lay bet, check the liability at the betting exchange is the same the calculator worked out for us. So in this example, the liability is £41.51. Check out our guide to liquidity for more information on liability. Next, it’s important to check your bets have placed correctly and everything is in order. Then it’s a waiting game. Enjoy the event knowing you’ll soon have a free bet to use how you wish. First off, check the bookie has unlocked your free bet – you’ll usually find the free bets either in your bet slip or within ‘your account’ section. Sometimes you’ll need to wait a few hours after your qualifying bet has settled. The next step is to search for another suitable market. This time we’ll pick slightly higher odds around 4 or 5. Ideally you want to pick a market with higher odds however this increases the bank balance required. In our example, we’ll use back odds of 4.5 and lay odds of 4.7. We’ll go ahead and add them into the matched betting calculator. Remember to change the bet type to ‘Free Bet’. The calculator tells our lay stake needs to be £37.39. Our liability at the betting exchange is £138.35. From this £50 free bet, we’ll make a guaranteed profit of £36.65, no matter where our bet wins. How awesome is that! So overall, from this Ladbrokes sign up offer, we’ll have made a total of £35.14. Not bad, considering it only takes a few minutes for each bet. That should give you a better understanding of how match betting works and how profitable this method is. With no risk matched betting you can enjoy watching your favourite team in the knowledge you’ll make a guaranteed profit no matter what the outcome is. I hope this matched betting guide has given you an insight into double betting and why the best time to start matched betting is right now. This method is at its most profitable thanks to the ever growing competitiveness of the betting industry. If you’re looking to make money online, matched betting is certainly your best bet. Thousands of people already rely on this method to earn up to £1000 per month tax free. More and more people are discovering matched betting websites like The Sure Bettor. With this trend set to continue why not join the vast community of matched bettors today at The Sure Bettor. Everything we do here is built to help you maximise your earnings through this brilliant money making opportunity. 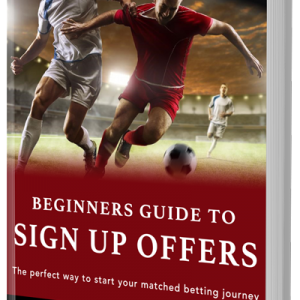 Thanks for reading our definitive matched betting guide – stay tuned for all the latest tips and tricks and much more.